The Bhakti Yoga Talks Swami Sivananda Pada Puga performed by Swami Venkatesananda This is the third in a series of talks given at Yasodhara Ashram in British Columbia in the Spring of 1975, following the Hatha Yoga & Karma Yoga Talks, and comprises lectures 41 thru 60 in the (approximately) one hundred hours of talks outline what might be regarded as Swami Sivananda's Integral Yoga. This section is entitled The Bhakti Yoga Talks. Unfortunately, Bhakti yoga is wrongly regarded to be appropriate for those incapable of rigorous and deeply intraspective investigations that accompany the likes of Raja and Jnana yoga. Such a view was not held by Swami Venkatesananda. To the contrary, he enjoyed pointing out that many saints and sages regard Bhatki as the culmination of Jnana yoga. And here, in these talks, he points out that the great Jnana yogi, Ramana Maharshi, spoke with high regard for self-surrender (an important aspect of Bhakti yoga), as was himself a very great devotee. Of course, the same could be said of Swami Venkatesananda, who often spoke of self-surrender and devotion to the guru. His devotion to his yoga master, Swami Sivananda was both steadfast and supreme. 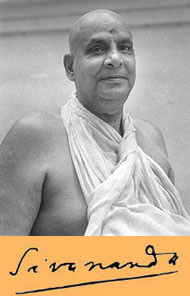 And while there have been many great devotees of Swami Sivananda, one could not say that there has been one more devoted and full of bhakti than Venkatesa himself. Therefore, with an eye towards enhancing our understanding and appreciation of Bhakti, Swami Venkatesananda brings together many alternate viewpoints, both orthodox and non-orthodox, in order to help us overcome the prejudice that surrounds Bhakti yoga, a path that has unfortunately fallen into disrepute in modern times. "Swami Sivananda used to say that in order to practice Karma yoga as a sadhana, as a method, as the means, not as the perfection itself, that Karma yoga has to lean on either devotion or wisdom, Bhatki or Jnana. The orthodox view has been that Karma yoga as the means, purifies the heart, and that Bhakti directs it, makes it flow toward the ideal goal or "God" or whatever IT (God) is. And, that then, through the practice of meditation, one steadies the mind, and finally one gets enlightenment, illumination. This is the usual orthodox explanation. But perhaps, if we look a little more closely at the whole structure of Bhakti (yoga), we may discover that it contains all the elements of all the yoga practices. It's not an isolated practice as such. It contains all the other elements, though it is called "devotion," (even) though it is called love of God. " *During recording, the cassette tape runs out in the middle of a sentence. ** Likewise, a small section of this talk was lost before the cassette was turned over and the recording could resume. The question and answer session raises many interesting questions. Here are some of them Does the student find the teacher, or is it the guru that takes on the disciple? How do we meditate? What does it mean to be detached? What is the meaning of "vairagya" or dispassion? What is the oneness to which we return? Is it natural to have difficulty struggling at the hour of our death? There is the death of the body. Is there another kind of death? More on the Bhakti Yoga Sutra (on likes and dislikes and to arrive at "no mind") on Bhakti being "an affair of the heart," and on the movement of Bhakti (the movement of concentric circles ... rather than the spiral movement we saw in Hatha yoga), on using the adoration of a person or an object, or on the contemplation of cosmic personality of Godhead, the avatara concept, etc., etc., etc. . In this talk, Swami Venkatesa discusses the five different types of "love," mentioned in The Narada Bhakti Sutra, Santa Bhava (a peaceful love, more often than not, what you regard as the non-violent yogi or monk), Vatsalya Bhava, (mother-child relationship) Dasya Bhava, (devotion of the servant for his master), Sakhya Bhava, (what we normally refer to as "friendship") and Madurya Bhava, (the lover-beloved relationship). In the same way that love needs no proof, these bhavas need no proof. They are, as Swami Venkatesananda was fond of saying, their own proof. Getting hold of them, and going deeper becomes the key for the Bhakti yogi to experience the love that will end division once and for all. Swami Venkatesa continues with some additional comments on Sakhya Bhava and Madhurya Bhava. Following that, the audience asks a variety of questions including an interchange regarding the practice of japa. "As the devotee progresses in his Bhakti or devotion, he feels intense anguish more and more intensely; not less and less as he progresses. This anguish is felt more and more! This is the paradox. The one whom you call the worldly man does not experience as much anguish as the highly advanced devotee experiences. That, again, is the Oriental explanation of Jesus' anguish on the cross. So that, it is only when you are very close to the other shore that you feel such great anguish, even at the slightest non-remembrance. In the case of the worldly man, for instance, he practically never remembers. He's never in a knowing contact with this divine love in the first place! He feels everything is all right! But as the heart becomes purer and purer, and as the love is experienced more frequently, it is missed more and more intensely. When the devotee is very close to the goal, to the experience of unconditioned ... unlimited love, (then) even a moment's non-remembrance of THAT is felt as tremendous pain, anguish." In this talk, Swami Venkatesananda examines Narada's pronouncements in The Narada Bhakti Sutras on the meaning of divine love, and feelings that arise out of the apparent lapse in awareness of the divine love relationship. "In the unconditioned, there is no limitation whatsoever. Ant which does not suffer limitation, is what you call God. We try to approach this as if some A-B-C equation can be found for it. But for that which does not suffer a limitation, no words or concepts can be substituted. That which you call God, is not a particular person, nor a personalty, nor a divine being, nor a non-divine being. All these words we use because have to use words. And so, we say the unconditioned being is God. If you don't want to use that word, don't use it. It's (merely) code. You may use the code G-O-D or you may use the code the unconditioned being (or unconditioned love). What is unconditioned love? It's a love that is divine, a love that is not limited at all by anything whatsoever. It is the same love that is being experienced in a conditioned and limited way when we love one another. But, because it is limited, and because it is conditioned, it suffers from various defects, deficiencies." “Perhaps a specialty, if we may call it so, of Bhakti, is the use of symbols. And, again, (neither Oriental or Occidental) throughout the world we have used dome kind of symbol to remind ourselves of the object of contemplation: God, Cosmic Consciousness, Cosmic Being, Supreme Bliss. Those of you who have read a very interesting book called The Source by (James) Michener, might remember that he mentioned that even in the prehistoric Middle East they used a monolithic stone pillar type of thing to represent God. Is it necessary? No. Is it helpful? Yes. It is not indispensable. One can do without it. And since that time, people have struggled to get away from it. When they get away from it, they invent something new. They abolish one thing, and immediately get into something new. I need a symbol! I need to look at what I am contemplating. Before I can learn to look within, I must learn how to ... look! After all, if I don’t even know how to look, how do I know what it is to look within? If I don’t know what it is to love someone whom I can touch, whom I can feel, whom I can smell, how do I know what it is to love at all? If I don’t know what it is to love, and what it is to communicate, commune with someone and learn the essence there, how can I love God? I must learn to love but learn to love the essence. I must learn to communicate, but learn to communicate with the essence, not just the form. How is this done? Thus, begins the introduction to talk number six of the Bhatki yoga talks, in which Swami Venkatesananda explores some of the symbols used in the practice of the Bhakti yogi." 12. May 19, 1975 Bhakti Yoga Disc 11 Day 6 Morning Talk -The Use of Symbols. Before moving on the the Question and Answer session in the afternoon talk, Swami Venkatesananda continues his discussion of symbolism by showing a slide show of some puga (worship) ceremonies, in order to discuss the meaning and/or purpose behind them. 13. May 20, 1975 Bhakti Yoga Disc 13 Day 7 Morning Session. Primary & Secondary Devotion. In its beginning stages older version is grouped under what is called Guani bhakti. Gauna means indirect or “secondary.” Therefore, this group contains what can be referred to as “secondary devotion.” All this is secondary devotion. The primary devotion is something different! “Mukhya” means “primary.” And Mukhya is the type which is primary devotion. The Gauna is secondary because it is ... “guna”; it has got guna in it. “Guna” means “characteristics” or qualities,” and “gauna” has got some characteristics or qualities to it. In other words: “he is a wonderful devotee” or “He is not a wonderful devotee!” or He’s a meddling devotee, an inferior devotee,” or “He is a superior devotee!” you can classify, and devotion which can be classified is called secondary devotion. You know: “She has a mother attitude towards God. She treats God as her infant.” Yes? and another might say, she treats Goddess as her friend. Another might say she treats God as her Master. All these are devotional attitudes which have characteristics and that’s called secondary devotion. Mukhya is primary, a love which knows no reason, which needs no justification, which is spontaneous, irrepressible, unreasoning. It’s just there, and therefore, it has no characteristic. It’s a love which cannot be described. As Narada says, “The Nature of of divine love is indescribable.” That is the supreme love that one has in one’s own heart. At that stage, you cannot even say that the devotee loves God. For him, there is no “God,” What is “God”? For him the Love is. Here’s it's like Love loves that Love. There is no description here. Any description is silly,"
Early on, in this afternoon discussion question and answer period, someone ask s the question: "How does one receive enlightenment?" Most of us probably wouldn't even have the nerve to ask such a question of the guru (probably each of us for different reasons). Of course, here it is put very directly and simply and the answer is equally direct and simple. After a short silence, Swami Venkatesananda replied: "First of all, enlightenment is not something which is received. The light just is. And the light shines. The light shines all the time. Yes? It's never not there! What is not there, and what comes into being can disappear. So, if enlightenment is something which can be received, (something) which is not there, and it can come into my hands, I can lose it. That which comes must go. Must go! That which comes into being must go. That which is received, that which is given, will be taken away. So, the light is! Hmm? The light is, constantly." "In a manner of speaking, I was asleep. Or, in a manner of speaking, I turned away from it. In a manner of speaking. And even that is an illusory notion. Even that "I am ignorant of this light, I am ignorant of this enlightenment, I am ignorant of this truth," even that is an illusory notion, all notions being illusory? All notions being illusions, yes? Is that clear?" Well, if that is not clear, no worries. This question and this answer becomes the jumping off point for a marvelous discussion about about illusion, vasanas, samskaras, the "I" and the "I am" (the Aham-Sphurna), with references to Ramana Maharshi, The Yoga Vasistha, and many things thought to be the province of anything but Bhakti Yoga. Note the recording of the master tape that was the source of disc 14 did not start exactly at the beginning of the session. A few sentences are missing at the beginning; nothing critical to the messages herein. In light of the fact that lecture eight deals with mantra and specific mantra practices, Swami Venkatesananda's prefaces the subject with introduction about control of mind, and the role it has to play in Bhakti yoga. Texts considered as basic by Bhakti yogis is The Bhagavatam. The word "Bhagavatam" means "oh God." and so, this book is called "the book that is a God," or, of course, "The Book of God." To a great extent, it deals with things like the creation story, the nature of God, the nature of things in this world, with the nature of this and what the nature of deaths come on how all these things were created, and by whom, how many times they have been created, and how it has all been maintained, and so on. One of the common practices adopted by the people who follow this path of devotion is reading and studying this book. It's not unlike the Jewish people reading The Torah. You go on reading it and reading it. If you don't understand something, you keep reading it. The reading itself is considered auspicious and meritorious. Frequently in the Bhagavatam, it is mentioned that even the devotional practices have a single aim: control of mind. What is control of mind? You may know the control of mind is widely considered the prerogative of what is called Raja yoga, but here, in the Bhagavatam, we are told the control of mind is fund is the fundamental aim of devotion. How can this be? We seem to be running out of track, yes? We are told "love, love, love!" And then suddenly, all this love is meant for control of mind? How can this be so? It can be so because when the mind is controlled, --Don't worry, I shall explain to you what control of mind actually means. ---, when the mind is controlled, it cancels itself out, and what remains is love. Love is not something which you can produce. Wealth is not something which you can conceive of. Love is something which you cannot figure out out what is to be applied. All fact is not love; those are just mere ideas, notions. But when the mind is controlled, "controlled" in the sense of "understood," than selfishness is removed, ego-sense is removed, all ideas, images, and assumptions you had about love and about God, and even about yourself and all the rest of it, all these are removed. When none of these ideas prevail in the mind, when no notions limits in mind, and no slots limit the mind, when none of these limitations prevail in the mind, what exists then ... is love. Therefore, love and control of mind are two sides of the same coin. I wanted to say that they are interconnected. But they are not even interconnected! They are not even interrelated! the most you can say is that they are two sides of the same coin. If you watch, when you really and truly love, your mind is not there. The mind has become no mind, which is satva. They use this other word for it in The Yoga Vasistha. never-mind, words are words. When there is love, there is no mind. When there is mind, there is no love it when there is mind, what exists is mere mutual understanding, a mere contract, mutual back-scratching, and sense gratification. And so, what one may say that bhakti or love of God, or the practice of devotion is an aid to meditation, one can say with equal justification for the control of mind and meditation are necessary in order for the love of God or devotion to arise. Swami Venkatesananda continues his discussion of mantra from the morning session, kirtan, and some discussion of " God's grace," or karma, or "God's will." "The concept of grace, as also karma, as also what people call God's will, all these have limited application. Why do I use the word application? Simply because you do not know what grace is. Why don't you accept that honestly? You do not know what and also really believed: "I know what God's grace is. I know what God's will is. I'm going to do it straight away." If you can do that well, then go ahead. But if you are being honest, you really do not know what your karma is before hand." "So, when you use the expression God's grace or karma or God's will, I use it afterwards. I use it after the event, never before! And why do I use it? Because I'm puzzled. Either I don't know why it happened, or I don't know why I did it, or I don't know why it happened to me." That's the reason why I use (the expressions) God's grace, karma, or God's will." Beginning with the subject of various forms of religious worship and religious ceremonies, including deity worship ceremonies that involve deity statues and the like, the discussion eventually returns to a more the universal theme of The Yashodhara Talks, namely the abolition of the divider. Swami Venkatesananda discusses two points of view regarding liberation, gradual evolution, and Sadyomukti, instantaneous liberation. And the close of this talk, he moves to the subject of total and complete surrender of the individuality. The nine forms of devotion all have as their end what is called Atmanivedana. This is "total, complete surrender." Complete surrender of what? Venkatesa: The I is surrendered by whom? Student: By the grace of God. Venkatesa: By the grace of God, but by whom? Venkatesa: If so, then what remains? Myself, again! By whom? So you see, it's not as simple as we make it sound. Total, complete surrender of the ego, of the I, means butter and relentless vigilance to ensure that come from then on, the "I" , the self, the ego-sense doesn't arise at all, and that from that moment onward, it is God alone that lives. from that moment, God alone is; there is neither me, nor you. It is not something which can be intellectualized. It is not something that can be conceptualized, and you know, stored in the brain. It is not a concept; it's not a notion; it's not an idea; it's not an ideal. It is not something which can be understood with the intellect. It is not a certain type of feeling. This surrender itself is Enlightenment! Once the person has truly come to this: "I surrender," the I is not there anymore. And therefore surrender need not be done twice. If there is a need to reaffirm the surrender, this means that the first time it was not done.That's rendered was that self enlightenment if it was sincere, if it was serious. From that moment onwards, there is neither seen nor virtue, neither pleasure nor pain, neither success or failure - the whole lot! Whatever have been described as the qualities of the devotee, or the qualities of a Yogi, are found in him naturally. There is sameness. There is utter peace, total equanimity. There is Atmanivedana, total and complete surrender of the individuality. "If a mantra is to be used, I must make it habitual without making it mechanical. It must become a part of my consciousness, yet not automatic or mechanical. The mantra must go on; it must become part of my mind. That's the whole idea of trying to synchronize the mantra with the breath while repeating it. So that, it becomes as continuous and unbroken as the breathing." "There are a couple of sutras in Narada's Bhakti Sutras that refer to this sort of thing. There is also one verse in the Bhagavad-Gita which insists on Anayas citayanto mam, he who remembers me constantly, remembers by repeating the mantra constantly. This is the same idea also expressed in The Bhakti Sutras. The question is: How to make a constant? Sivananda also used to insist upon it: Constant Namasmarana or Unbroken remembrance through mantra!" "But you must distinguish this constant remembrance from a mechanical remembrance. This action is not automatic, yet it is constant. It is constant! And it is from there that constant vigilance may arise. But, I must constantly repeat the mantra without making it mechanical. First let's come to the mechanics of it and then, will see how to make them take the mechanics out of it." We started by defining Bhakti as "Parama Prema rupa." You may recall that "prema" means "love, and that "parama prema" means "supreme love. "Why did we make this division between "love" and "Supreme Love"? Why do we divide? When the ego-sense is there, the mind being the divider, the ego sense being the divider, we do not assume that the division does not exist, and so we pretend that "I am in cosmic love." And if one does that then the sensual part of it, being more attractive and more tempting, keeps when there and so, one remains there, (in division) calling that "love". If you go to a medical dictionary, you'll find that the human body is said to be at least 75% water. Water flows down more easily than up. The mind flows down more easily than an up. and therefore, it is easy for me to say, "well, I practice cosmic love." But what does that mean? It means that I let myself go, and do I feel like doing. That's not love, and that's not cosmic love. It means that the mind is divided everything into the sensually pleasant and the sensually unpleasant. Here the mind roam, and seeks all that is pleasant, loves all his pleasant, and says "Ah, I am practicing Cosmic love!" In order to avoid this danger, the sages said that it is better in the beginning to discriminate, so as to ensure this imbalance is corrected. When this imbalance is corrected, eventually you will come to the stage where the division is abolished, Justice division is abolished in the wake behind a boat. That is why we said that Bhakti means both the division and the union or devotion. There is first the division, and then eventually there is devotion. So recognizing the existence of the division, recognizing the existence of the divider, which is the mind in the ego sense, they (the sages) said, " these are lower forms of love and this is the higher form of love." Otherwise this division of prema and para prema is absurd. Why must I create a division if I want to abolish it that would be absurd. I do not create a division the division authority been created by the divider, Which is the ego sense in the mind. I see the division. I see the division is existing, take note of it and advise caution. Bhakti recognizes the already existing division. When you open your eyes come on when you open your mouth when you begin to think, the division is already there. You are caught in the division. As long as the mind functions, as long as the ego-sense functions, division is made. Now, normally, we are caught up in this division. We are not aware of it, but we are making this division because we're a living a more or less automatic life. Just like, for instance when you are driving on one side of the road; you are not aware that you are driving on one side of the road and not the whole road. You are used to it, so that (automatically), as soon as you get into the car, you drive on the right side of the road. The division has been made by the mind, but you are not aware of it at all Bhakti recognizes that division, and therefore Bhakti is called "division." But Bhakti is both division and devotion. It does not make a division, but it recognizes it is in there. The division is there! As soon as I open minds, "I -- You." the division has arisen. If I do not recognize it but allowed to exist, it is not canceled; it is there! So how do I put an end to that division? By becoming aware of it! And then, a I become aware of pain caused by the division. I become aware of the problems created by the division. And lastly, I become aware that the division is not real, but that somehow, it has been created by the functioning of the mind, by the functioning of the ego sense. This concludes the Bhakti Talks given at Yasodhara Ashram in 1975 by Swami Venkatesananda.